This free-to-play real-time PVP strategy game is based on the Star Wars universe and combines elements from Clash Royale and Vainglory. This includes collectable cards, tower defence, and mobile online battle arena (MOBA). Players basically have to win battles so their rank increases and they reach higher tiers that contain better cards in their packs. Star Wars: Force Arena features characters, locations, and technology from the Star Wars saga up to and including Star Wars Rebels and Rogue One: A Star Wars Story. On release (January 11th 2017) there were sixty-five characters available. 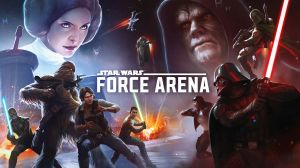 No discussions open for Star Wars: Force Arena at the moment.